As most of you are aware, many activities are taking place at Eastman Business Park (EBP) these days to evolve the site into a multi-use, multi-tenant industrial and technology park. We’ve opened its doors to the next generation of entrepreneurs, innovators and employers, making EBP’s infrastructure available to help accelerate middle-stage technology companies, and allowing them to develop their businesses from the lab-scale prototype stages of innovation to the later stages of production and commercialization – with a special focus in the areas of energy storage, biomaterials and functional films. As a matter of fact, EBP is often characterized today as a “unique innovative ecosystem.” I like the ecosystem characterization, and I think it will be important to the future of the site, especially as it relates to sustainability and shared benefits for EBP tenants moving forward. From an HSE perspective, I see a lot of value in the concept of the industrial ecosystem. It means more than just an efficient site that recycles and conserves energy. It means more than a site where the tenants simply co-exist. In an industrial ecosystem, tenants build linkages to each other so that the waste streams and by-products of one make up the feedstocks of another. In this way, all tenants get economic benefit while the reduction in environmental impact for the site is multiplied. It’s these linkages that differentiate an industrial ecosystem from just another green site. And, it’s these linkages that I already see at EBP – and which can continue to drive success at the site. A great early example of the working industrial ecosystem is in Kalundborg, Denmark. The Kalundborg Eco-Industrial Park was founded in 1959 as a power station, and began its first experiment in industrial ‘sharing’ in 1972. To this day, four main industries and several smaller ones co-exist at the Eco-Industrial Park where steam and various raw materials such as sulfur, fly ash and sludge are exchanged in what is the world's most elaborate industrial ecosystem in operation today. And, just like EBP, the whole site is anchored around a power plant. EBP’s power plant (now owned and operated by Recycled Energy Development/RED-Rochester) creates the hub of our industrial ecosystem, and a very efficient hub it is. In a typical public utility, about a third of the generated steam is turned into electricity, while the rest ends up as heat lost to the atmosphere. At EBP, almost two-thirds of the steam is converted to either electricity or used for heating and cooling. And, once the energy is extracted, the steam condenses and the resulting liquid is pumped back to the power plant to start the cycle over again. 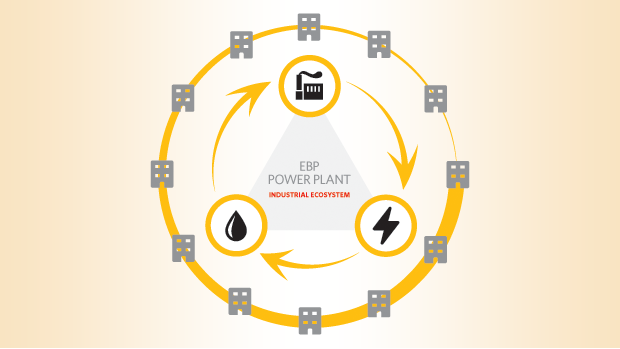 Because of the effectiveness of this tri-generation process, the power plant is able to generate 100% of the EBP tenants’ electrical requirements and their heating and cooling needs, while operating as one of the most efficient plants in the world. Solvent Operations is another great example of our very own waste to feedstock closed loop operation. In 2011, 43 million pounds of solvents were recycled into virgin solvents with 22% of the total derived from non-Kodak sources. That means we took almost 9.5 million pounds of other companies’ waste and turned it into a valuable raw material. In fact, one of Kodak’s most commonly used solvents is solely sourced through solvent recovery. The similarities between EBP and the Kalundorg Eco-Industrial Park don’t end with the power plant and a few examples of close loop recycling. They both also offer a shared services model, emphasis on vertical integration, a collaborative management structure and a tradition of strong community engagement. Altogether, I think it’s clear that EBP offers all the unique benefits of a major industrial ecosystem, providing a sustainable home to existing tenants and many more prospective tenants in the years to come. For a site that was built over a hundred years ago, it has a bright ‘green’ future!